Erskine was born in 1786, the second son of Thomas Erskine, the 1st KT, PC, KC, 1750 – 1823, Lord Chancellor 1806-07, and a member of the ancient Scottish family of the Earls of Mar. He was educated at Harrow School and Trinity College, Cambridge, graduating in 1806. In 1813 he married Lady (Mary) Harriet Dawson, daughter of the Irish peer, the 1st John Dawson and the son of the 2nd Viscount Carlow). He was Rector of Loddington, Northants. 1816-17, before becoming Rector of Swithland, Leics. from 1817-1830. Erskine and his wife had five daughters between 1820 and 1827, including one set of twins. However, in December 1827 Harriet died at Swithland and was buried at Rothley Temple. 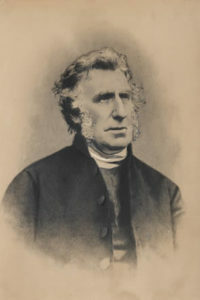 Erskine was then Vicar of St Martin’s, Leicester, from 1830-1841. During his time at St. Martin’s, Leicester, (and with the Lit and Phil) Erskine – a liberal Whig like his father – had been supportive of political and religious reform, and also of educational advancement, particularly through the Leicester Mechanics’ Institute. After the 1835 municipal reform he sought to promote reconciliation between Leicester’s long-standing ruling Tory/Church elite with the town’s now politically powerful nonconformists – something that was very much part of the agenda of the Leicester Literary and Philosophical Society, newly formed in 1835. In much if not all of this he was very much at odds with his own elected Churchwardens and Vestry, who having lost their traditional political power to the new elected Corporation were determined to fight back in every possible way. In this they focused on the levying of church rates for the support of the Church of England on all ratepayers in the parish regardless of their religion. Erskine, in contrast, argued that in fairness only Church members should be taxed and that instead the Government should make up the difference by contributing to the maintenance and expenses of the Established Church from public funds. Many of the town’s nonconformists living in the St. Martin’s parish refused to pay to support the Anglican church on grounds of conscience, and in 1838 the Vestry started proceedings against 27 defaulters in the ecclesiastical courts. A test case against a local draper, Baines, who was a member of the Harvey Lane Chapel, was brought in the highest(and most expensive) English Church court, the Court of Arches, which found against him, ordering him to pay the outstanding church rate levy of 42 shillings together with the whole of an enormous claim of £125 3.0d. in respect of the parish’s legal costs. An appeal was heard in the (civil) Court of Queen’s Bench, and when in 1841 the decision of the Court of Arches was confirmed the parish authorities ordered the bells of St. Martin’s to be rung in celebration. Baines still refused to pay the £2 tax and so the Churchwardens had him committed to the County Jail. Erskine was amongst the first to visit him in jail, assuring him that the Churchwardens had acted throughout without consulting him (knowing that he was completely against all of their actions) and that he completely disapproved of everything they had done against Baines. It seems very likely that Erskine’s move in 1841 very soon afterwards from the large and prestigious parish of St. Martin’s Leicester, to the tiny village parish of Kirby Underdale in a remote part of the East Riding of Yorkshire was prompted by this breakdown of relations between Erskine and the mostly hard-line Tory parishioners. He was Rector of Kirkby Underdale, from 1841-59. He held this Living alongside that of Prebendary of Warthill in York Minster for 1845-47, and then as Dean of Ripon from 1847 until his death and burial in Ripon in 1859. Sources include: information from Canon R.A. Horton, Rector Swithland; Gentleman’s Magazine vol. 98, Jan. 1828; 1841 Census; Death Registers for 1859; The Times 29th July 1859; Patterson, A.T., 1954. Radical Leicester (Leicester); Barton, S., 1993. The Mechanics’ Institute: Pioneers of Leisure and Excursion Travel. Trans. Leics. Archeol. &amp; Hist. Soc., vol. 67; Erskine family and other genealogies.